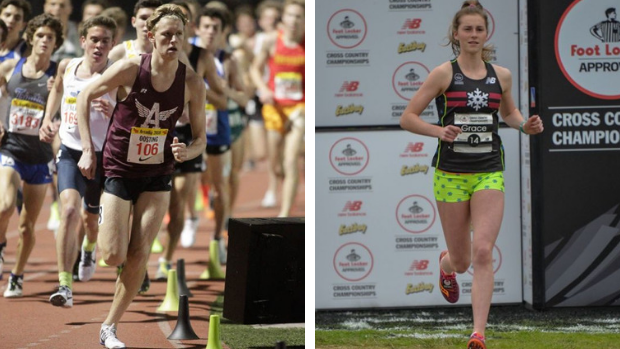 Despite waiting until October to race (not including dual meets), Arlington (MA) High School's Ryan Oosting and Natick's (MA) Grace Connolly haven't missed a beat. The pair from Massachusetts are coming off stellar performances over the last 10 days and seem to be in prime position to capitalize off efforts heading into crucial postseason meets over the next few weeks. But let's start with Connolly, who's ranked No. 19 on the MileSplit50, first. The high school senior captured a massive win on Saturday, taking the Brown Northeast Invitational at Goddard Park East in East Greenwich, Rhode Island, with a time of 16:35.30, destroying the field by exactly a minute. Lee went on to finish 10th at NXN in 2016, while Gaughan was 5th at Foot Locker in 2017. But why that mark is impressive comes down to history. Over the past two seasons, winners of this invitational have gone on to top 10 performances at nationals. A year ago, it was Exeter (NH) graduate and Notre Dame freshman Jacqueline Gaughan who went on to finish fifth at Foot Locker Nationals after a winning time of 16:48 at Brown Northeast. The year before, it was Shoreham-Wading (NY) graduate and Georgetown freshman Katherine Lee, who ran a course record 16:45 and then followed with a 10th-place finish at NXN. Connolly's finishing time on Saturday, in a meet record 16:35.30, was 10 and 13 seconds faster than either of those runners. And she's now one of just two others to break 17 minutes on this specific section of the course. So that performance, to be quite honest, was a ridiculous statement. Connolly will ultimately have to prove her position over time. As a sophomore, she qualified for Foot Locker Nationals and finished ninth. She closed her season last year after claiming her second straight Eastern State and All State Finals Championships. But through two performances over her senior season, she's shined even greater. Oosting, meanwhile, has raced just one meaningful invitational, winning the Bay State Invitational in 15:49.00 on Oct. 13. But history has told us that the Spy Ponder senior will be in the thick of things come the postseason. It's one of the reasons why he began the season at No. 10 on the MileSplit50. In July, he finished third in the 3000m at the European U18 Championships for Holland, then was invited to the Nike Elite Camp in Oregon in August. Those facts alone should have earned him breathing room. Oosting told MileSplit in August that he was never really worried about racing over the first few months of the season. He simply wanted to be healthy for October, November and December. But now it's time to earn his keep. Oosting has four straight weeks of racing on his calendar in November. He has scheduled dates at the MSTCA Coaches Invitational on Nov. 3, the MIAA Eastern State Championships on November 10 and the MIAA All-State Finals on Nov. 17. On November 24 comes Foot Locker Northeast. Both Oosting and Connolly could potentially race at Van Cortlandt Park in New York. And by then, the likelihood is that they'll be as ready as they've ever been.